This evening I had the motivation and sunlight to check the trail cameras out on the property I have been monitoring east of the Sandy River. I got plenty of photographs featuring more thrushes and robins foraging in the leaf litter. There was a dog or two, along with a domestic cat. Along with the normal cast of nighttime characters, I got this photograph of a raccoon that is cool enough to share with you. I do like glowing eyes (reflective, in this case). I was lucky in the timing of this visit. The property owner was going to a property he recently purchased a few miles away, which I had been wanting to see for several weeks. He has been renovating the house on this newer property, with the help of some contractors. About a month ago, one of the contractors returned to the property after hours to pick up a tool he had left there earlier. He reported being greeted with a very strong and foul animal odor. He hunts both elk and bear, and is intimately acquainted with the odors of both of these animals. He had never smelled anything like this before, and it scared him. He quickly got the tool he returned for and left immediately. Well, needless to say, that is right up my alley. The woods from where the smell originated. Today I got the opportunity to explore part of this 5 acre property, and I believe it holds a high potential for producing bigfoot evidence. There are huge expanses of unbroken tree cover, a year-round creek that runs through the property feeding a larger creek nearby, several ponds, a couple marshes, large properties with livestock and gardens, and even power lines not too far away. All these features within a few miles makes this an exceptional possibility. 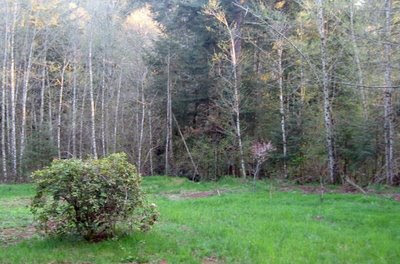 The yard ends at the forest, which drops 25 feet below to the creek. 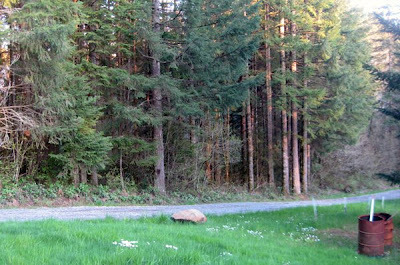 The property owner, being a witness himself, has graciously let me have access to both of his properties for the purpose of photographing a bigfoot. We walked the property and placed two cameras at strategic locations. When placing cameras, I tend to spend a fair bit of time hiding them. 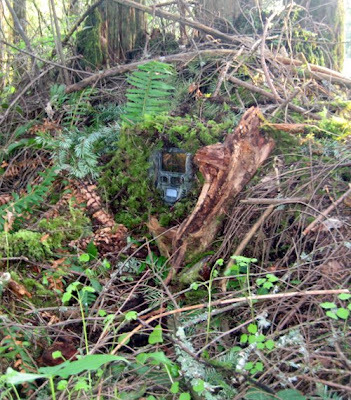 I kills me to see bigfooters strapping cameras on trees to try to catch a photo of a bigfoot. That may work on deer, but these things aren't deer. Not even freakin' close. Don't underestimate the 'squatch! Their very existence depends on remaining hyper aware of everything around them. Even my ten minute effort is not good enough to fool a bigfoot, in my opinion. The technology needs to improve, or a sasquatch has to make a really big mistake. I'd be a fool to hold my breath for either, but I'm hoping for both. but I believe it falls short of what is necessary. I now have two sets of cameras deployed in an area of both historic and recent activity. I know of two sightings and several "Class B" events from the previous six months, and all within three miles of this location. I couldn't be happier about this lucky turn of events. 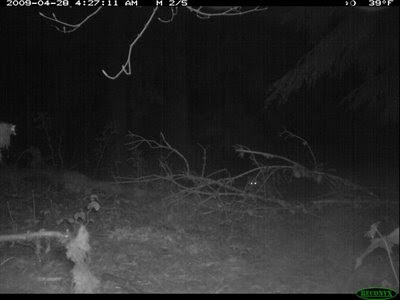 Plans for the new property (which I will dub the Sandy River Project Site#2, or SRP2) include copious amounts of yummies left strategically around the yard, 24-hour video monitoring with motion sensor DVR's, and as many trail cameras as I can get my hands on. ...which brings me to the "donate" button to the right. 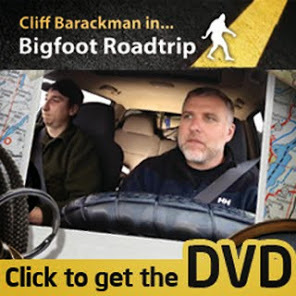 No pressure, so just ignore it if you're not in any position to feed somebody else's (my) bigfoot research addiction. However, just in case you have a couple extra coins lying around, I am accepting donations that will be used towards bigfooting equipment. Batteries, memory cards, gas, and plaster aren't cheap, and every penny helps. You can even donate gear instead of money, but that involves contacting me at NorthAmericanBigfoot@gmail.com. Jane Goodall: "Bigfoot? Oh My!" "He was here last night"